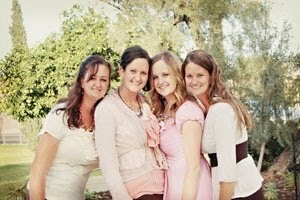 As many of you know, we are a group of four sisters. We were excited when we were contacted by a group of five sisters to review a book they had just written. We jumped on the idea and haven't looked back! I absolutely love the idea that this group of sisters had about writing down their history. But as most of you know that have siblings, we all have different memories, even if it is about the same event. In this book, all five sisters share their memories about growing up in a small town. This book will make you laugh, cry and reminiscence about your own childhood and memories of family and friends. It has really opened my eyes to the importance of writing down family history. You will love reading this book! "When the five of us get together, we always come back to our memories of growing up. Our ages span nearly twenty years, so our memories are oftentimes very different. This creates some interesting dialogue. One sister starts out a story, and the others soon chime in with their version. Whenever we are all together, we get comments from others saying they wish they were a sister. The book Fluffy, Funny, and Fabulous: A Tale of Five sisters was written a a collaboration between all five sisters. Each chapter starts out with me( Anita) telling about my memories, then Vicki gives her story, and on through all sisters. While the book is intended to be humorous it also deals with serious events like the death of our Father and of our Nephew. All five sisters live in the Midwest. Anita in Aurora, IL, Vicki, approx 20 miles away in St. Charles, IL, Linda in North Aurora, Helen in East Moline, IL approx. 125 miles from the us and Ruth in Lake of the Ozarks, MO. We all talk several times during the week and get together at least 4 times a year." My favorite memory is hard to come up with... but one of my memories is my father rocking me to sleep and singing to all of us before bed. I grew up in a small town as well and I just love the quaintness and quietness of a small town. My favorite memory was the day my dad surprised us by buying a pony for us. His name was Old Blue and we had so much fun riding him all over our country roads! The day my dad surprised us with a pony is one of my favorite memories. We loved that pony so much and rode him all the itme on our country roads!